The Ministry of Environment & Forests (MoEF) celebrated 16th September (2010), as the International Day for the Preservation of the Ozone Layer. The date marks the signing of the Montreal Protocol on Substances that Deplete the Ozone Layer. This commemoration around the world offers an opportunity to focus attention and to take action at global, regional and national levels for the protection of the ozone layer. At the function organised at FICCI Auditorium and presided by Shri Jairam Ramesh, Minister of State for Environment & Forest (I/c), India reiterated its commitment to the protection of the ozone layer. Addressing the gathering of school children, government officials, NGOs and industrialists from various sector, the Minister highlighted the rich environmental history of India – our association with rivers, our worshiping of animals, etc. Environment is not a lifestyle in our country but it is a matter of livelihood. The Minister further clarified that when we save our mountains, rivers and forests, it is not obligation on anybody, but it is important for our daily life because crores of people in our country are dependent on forests. He also urged the audience to take actions to protect ozone while highlighting the successful implementation of the Montreal Protocol and its role in protecting the ozone layer. 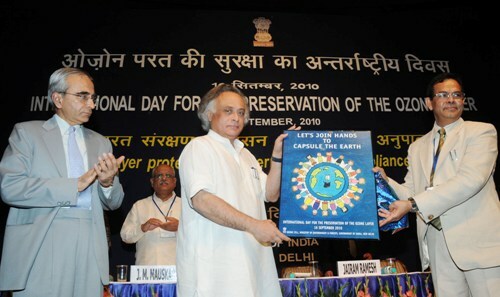 The occasion marked the release of posters, stickers and the 12th edition of the “The Montreal Protocol: India’ Success Story” which contains relevant aspects of India’s commitment to the Protocol. Several competitions like model making, skit competition, slogan writing, poster making, painting and quiz on ozone were organized for school children and the winners were awarded prizes. For promotion of books in Hindi on Environment and related subjects like forests, wildlife, pollution and water resources the MoEF has introduced a scheme for awards to Indian authors having original work in Hindi under the Medini Puraskar Yojana. The event also saw prize distribution under this scheme and the first prize was awarded to Shri Naveen Kumar Gupta for his book ‘Global Warming ka Samadhan: Gandhigiri’. The second prize was awarded to two persons, Dr. Gaytari Parshad and Dr. Rajesh Nautiyal for their title ‘Paryavaran Bhoogol‘. Shri Rajendar Joshi won the third prize for his book ‘Prakriti, Paryavaran aur Bajarvad’ and a consolation prize was given to Dr. C. L. Garg for his book ‘Swachcha Paryavaran, Swastha Jivan’. The National Awards for Prevention of Pollution, which was instituted in 1992 to encourage industries and operations to take significant steps for prevention of pollution was also announced. The idea is to promote those among the highly polluting industries, which make a significant and measurable contribution towards development or use of clean technologies, products or practices that prevent pollution and find innovative technologies, products or practices that prevent pollution and find innovative solution to environmental problems. Companies like M/s Indian Rayon, Veraval, Gujarat (Caustic Soda), M/s Binani Cement Limited, Sirohi, Rajasthan (Cement), M/s Indina Farmers Fertilizer Cooperative Ltd. (IFFCO), Phulpur Unit, M/s Indian Oil Corporation Limited (Bongaigaon Refinery), Assam (Oil Refinary), M/s Reliance Industries Ltd., Dahej, Bharuch, Gujarat (Petrochemical), M/s BILT Graphic Paper Products Ltd., Pune, Maharashtra (Pulp & Paper) and M/s Binani Zinc Ltd., Karala (Zinc Smelting) were awarded National Awards for Prevention of Pollution for the year 2008-2009. The Rajiv Gandhi Environment Award for Clean Technology, which was instituted in 1993 and is conferred to one of the best among 23 categories of highly polluting industries, was also given away during the event. The idea here is to promote the adoption of Clean Technology by companies that fall under these categories. Dahanu Thermal Power Station, Dahanu, Maharashtra, M/s Reliance Infrastructure Limited companies were awarded the Rajiv Gandhi Environment Award for Clean Technology for the year 2008-2009.